Join Chef Mom Rosebud Benitez for another round of 10-minute kitchen wonders here on Quickfire, a step-by-step guide to delicious everyday meals for the busy you. Instead of your typical chicken curry, try these delicious prawn curry recipe for an unforgettable curry night. Prawn curries are quick and easy to make, and a nice change from a heavier curries. 1. In a large covered pot melt the butter. Stir in the flour and then the salt, curry powder, and ginger. Add Ajinonmoto Umami Super Seasoning. 2. Blend in the milk and then the coconut milk, gradually. Cook, covered, until the mixture comes to a boil , stirring from time-to-time to keep the flour in suspension. 3. 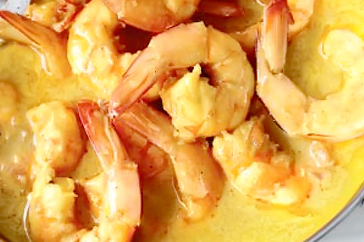 When the curry sauce is simmering and thickened, stir in the lemon juice and then the prawns. 4. Cook, covered, stirring occasionally, until the sauce is simmering again and the shrimp are bright pink and tender. 5. Serve with hot rice sprinkled with green onions as garnish.